Now that your practice calendar is created, it’s time to write workouts to assign to a practice. We will cover the web version here; you can also write workouts in OnDeck Coaching Tools. In Coaching Tools, practices are composed of one or more workouts, workouts are made up of one or more sets, and sets are made up of one or more swims. Two approaches to assigning workouts are building a workout from scratch within a practice or assigning a pre-created workout from your library. Let’s begin by building a workout, then we will assign it to a practice. To begin building, click the Workouts tab. Click + ADD WORKOUT. This will open the Add Workout screen. The Alias will be an abbreviation of the Workout Title and will be displayed in the Practice Calendar. If you plan to reuse the workout, name it something memorable. Select the appropriate Course for your pool type. Tab to or click in the Tags field then type or select one or more tags. Add a new one by typing the name (max. 15 characters) and pressing Enter or clicking + Add Tag. You can then set filters to find workouts by tags. If you click Add to Favorite, you can set a filter to display all workouts marked Favorite. If you click Save as Draft, no other coaches but you will be able to see it until you uncheck it later. Best Practice: Create swim meets as workouts. Since swimmers both warm up before a meet and swim harder than ever during a meet, set up your meets as workouts and take attendance for them. Then all your swimmers’ work will get included in your reports. What really makes Coaching Tools’ Web Workout Editor powerful is its keyboard shortcuts. Become familiar with these shortcuts and watch your productivity soar; they are FAR faster than using a mouse. We will list keyboard shortcuts to tasks in parenthesis. To quickly access this guide in Coaching Tools type shift+?. Now you will build the workout by adding sets to it. You can either add brand new sets you create on the fly, or select from previously built existing sets. We will show you both ways. Although we are showing how to build sets within the Add Workout screen, you can also do the same thing within the SETS subtab. Recommendation: Build 20 or so of your core sets—warm up, kick, pull, main, warm down—and then you can leverage the Clone function to build more sets. Click + New Set (or type tab+ n). This will open the Add Set screen. If you are on the SETS subtab, click + Add Set. Enter a Set Name (unless you uncheck Export to My Set Library). Tab to or click in the Tags field then type or select one or more tags. Add a new one by typing the name (max. 15 characters) and pressing Enter or clicking + Add Tag. Export to My Set Library, when unchecked, is a throwaway set that does not require a Set Name and has no Tags. Add to Favorite, for which you can set a filter. Is Test Set?, which allows you to time and track all the swimmers who participate in it. Test Sets show in red in the workout list. Tap + New Swim (or type tab+ n). This will open the ADD SWIM TO SET screen. 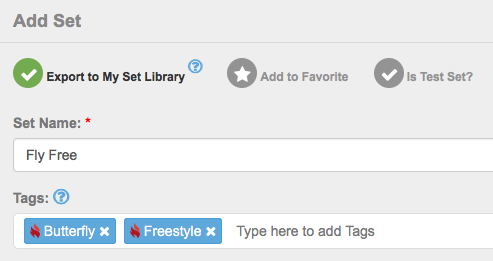 You can add your own custom Strokes, Set Types, and Descriptions in the CUSTOMIZE tab. Select the correct Stroke and Energy Level for accurate reporting. To enter a Race Pace, pick the desired pace from the RP dropdown, tap + to switch it to a - if you want to subtract seconds instead of adding them, and enter the number of seconds to add or subtract if desired. The Description will appear by each Swim in the Set and is necessarily short due to display width constraints. Use Set Notes for a more detailed description of the set. Best Practice: Your reports are only as accurate as your data. Make each swim as complete and accurate as possible so both coaches and swimmers get a true picture of their progress in reports. The PACE column automatically shows the 50 yard or meter pace for each swim, i.e., the time that each swimmer should take per 50 yards/meters based on the swim interval. Pace = Interval time / (Rep Distance / 50). Click the checkmark (or type tab+s) when finished and this will add the swim to the set. Click + Swim Rest (or type tab+ r) to add a rest. Beyond adding additional swims and rests, you can use the up/down arrow keys to highlight a swim or hover over the row to see action icons. Now you can click one to edit it type e), clone it (type c), delete it (type d), or drag and drop to rearrange the order. Tip: Cloning swims is a quick way to create variants. For example, create descending swims by starting with a 4x50 @ 0:50 swim, clone it and change the clone to 0:45, and clone it again and make it 0:40. Click Clone (c) then click Edit (↓ e) on the cloned swim to quickly add a new swim that only needs minor changes. We suggest adding a few swims to build a set, but not an entire workout. Add Set Notes if desired. Click Save (or type tab+ s). If you hover over the Set you just added you will get the same icons as when you hovered over a Swim to Edit, Clone, etc. In the same way you can create swims variants, you can create set variants. Repeat the above steps to add more new sets, or the below steps to add existing sets from your library. Best Practice: It’s typical when writing sets and workouts to build a new one every time. But since Coaching Tools stores them, you can be more efficient by reusing existing ones. On the right is your Set Library, which has both sets added by your team and those from the Community Workout Library. Type tab+ lto move the focus there so you can use keyboard shortcuts. Here you have three tools to quickly find sets: Search by typing a name (type tab+ f to move the focus there), Sort, and using Filters. Use the ↓ ↑ arrows to move the selector up/down. Once you find the one(s) you want, select them, or press Enter or double click them to add them to the workout (if you do the latter, you can skip step 6). You can continue to use the search tools to find and select more sets. Once you've selected all the ones you want, click Use Selected Sets. They will be added to your workout in the order you selected them. Press tab+w to move the focus back to the Edit Workout pane. You can drag and drop sets to rearrange them in the workout. You can add rests between sets. Click + Single Rest (or type tab+r), enter the rest time, press Enter or click the green checkmark, and drag and drop the rest if needed to place it where you want among the sets. Or click + Multi Rests (or type tab+ m) to enter the same rest period in between all the sets. Click + New Line Note to add an inline note you can drag and drop in between sets. Add Workout Notes if desired. Alternatively, click Save & Share to share your new workout in the Community Workout Library for other Coaching Tools users to benefit from. You can share up to 10 of your workouts (this limit keeps the library uncluttered). You can later click UNSHARE to remove it from the library and make room. As for the TAGS MANAGER and CUSTOMIZE subtabs, we cover those in the Initial Setup lesson. Let's now add your workouts to practices.